Zero degrees and our Camelbacks turn to ice 2,000 feet below Kilimanjaro’s summit. Five days of steady marching behind us. Almost home, but struggling. Team chatter is eerily silent. 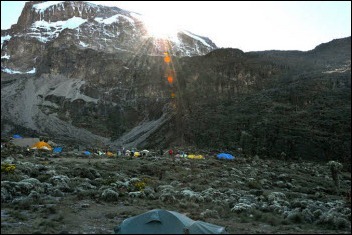 Heads hung low and lamps dim, distraught climbers from other groups turn around short. Fear and doubt slither through our minds. Can I make it to the top? Will I be the one who fails? “Angels We Have Heard on High” pierces the silence. Sensing our internal turmoil, the guides sing a familiar melody that shatters our foreboding. The crescendo of “Gloria” generates a second wind. Spirits lifted, we proceed with renewed vigor towards the prize. Panting with joy, we crest Stella Point at sunrise. We pause on the volcanic rim, a mere 750 feet from the peak. We will make it. All of us. After a brief round of hugs, we persevere towards the summit. Without a word, the four founders quickly move out and up the line of march. We conquer the final stretch together. 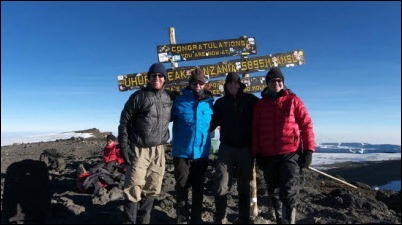 Kilimanjaro was our collective idea, our blood bond, thus important and symbolic to finish together. After more hugs, high fives, and requisite pictures at the peak, I cry, hard. Fortitude. Mental toughness is only honed via trial and refined by fire. No amount of mental gymnastics can prepare you like reality can. Don’t throw in the towel in tough circumstances. Put one leg in front of the other and move forward. Training. A person rises to his level of training, not to his expectation. No exceptions. If you don’t make the time to train, you don’t make the team – period. Over the year, most climbed smaller peaks in preparation. Gear. Reaching the top requires the right gear. No amount of training or exhortation can close the distance between success and failure when you are ill equipped. Invest in yourself and the team. A lack of gear equals climbing failure. Vulnerability. We threw out titles before taking the first step. Administrators, presidents, physicians, and teens were now peers. Spending 24×7 with strangers requires a rapid adoption of transparency. The first day, we peed from a distance and behind some trees. Come day two, we’d grown beyond these formalities. Encouragement. Maximum performance is nearly impossible without a pat on the back from a friend. Kind words work like salve on a wound. Nutrition. You can fake your way and run on adrenaline for a day or two. But without sustained energy, you will collapse. Leaders must replenish themselves routinely. Attitude. Zig Ziglar’s adage proved true: “Attitude, not aptitude, determines altitude.” No one benefits from listening to naysayers. Good leaders present good attitudes, even when they feel like vomiting. Teamwork. Individuals caring for individuals, together. Shared hardships hasten lasting bonds. Planning. Although the journey took only seven days, we organized over seven months. Anything worthwhile requires diligent strategic and tactical planning. Support Team. We had an incredible support team comprised of friends and family. On the mountain, we had guides and porters. Climb High, Sleep Low. Reaching new heights requires giving up some ground. 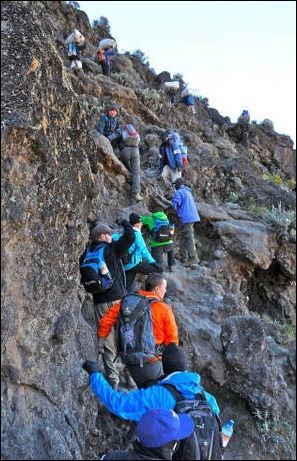 We spent a couple days where we gave back more elevation than we conquered. Although ‘straight up’ seemed the shortest distance, a sheer, vertical route would lead to breakdown. Every mountain has its peaks and valleys. Embrace these. PoléPolé. To reach the highest summits, take time to acclimate at various heights and simultaneously build endurance. If you rush, the odds of success diminish exponentially. Sometimes you must go slow to go fast. Be in the moment. A leader must shrink the gap between frontrunner and laggard without losing sight of the ultimate objective or compromising passion. We unveiled our corporate flag in front of the summit sign. This band of ruffians brought together 11 individuals and over the course of planning and execution built a team. 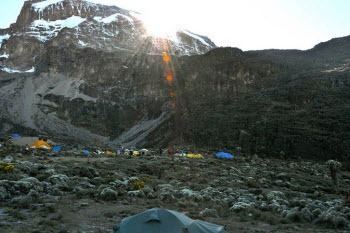 The Kilimanjaro success rate is 60-70%, but we achieved 100%. Success demanded leadership and followership. That rock taught us a lot. Changed us. Did someone say Everest? Ed, great article. Congrats on the feat and thanks for sharing your lessons, applicable in so many areas. What awesome inspiration. Thanks for sharing some great transferable lessons. I’ll add one more I’ve learned. Find enjoyment in the journey not just the summit. I look forward to each of your articles. Once again, you did not fail to deliver! Thanks for sharing. Enjoyed reading about this great adventure which will help you in making further decisions in your career. fantastic personal and team accomplishment Ed! Congratulations to all. Another wonderful and inspiring post Ed. Thanks so much for sharing this! Awesome! Can’t wait to hear about the medical clinic. Heard some epic rumors. Please do tell!